Please join us at LifeSpace this Sunday 15 October at 3pm for an Artist Talk with Andy Lomas as part of our current exhibition bubble, bulge, bleb. Andy has long been fascinated by D’Arcy Thompson’s work and the influence of his book On Growth and Form. For his works included in our exhibition bubble, bulge, bleb, Andy has focussed his attention on the production of animations and objects that exhibit properties of growth within software systems he writes himself. There are many parallels between Andy's software and the generative modelling systems used by scientists including Dr. Rastko Sknepnek here at University of Dundee. Come on Sunday to this public talk and discover more about the development of his art works and influences on his practice. All welcome. This event coincides with the D'Arcy Thompson On Growth & Form Centenary Conference from 13-15 October 2017 at University of Dundee. Celebrating the centenary of D’Arcy Thompson’s On Growth and Form, the School of Life Sciences, University of Dundee, presents an outside exhibition with works by artist Andy Lomas inspired by their shared view on the “perfection of mathematical beauty”. Lomas’ works are the result of an exploration of natural processes of growth; these generative forms relate closely to the research carried out at the School of Life Sciences. This exhibition reveals how the simulated structures resonate with today’s research in biology, physics and chemistry. These “spheres of action” visualise growth, much like the active particles that can be seen in the renders by Dr Rastko Sknepnek. In this project, Sknepnek was asked to comment on what the forms of Lomas’ works might convey. Thoughts from Sknepnek and D’Arcy Thompson are combined to show the interaction between forces in science as well in as art. Please join us at the Preview event for our new exhibition Beyond Skin. During the preview we will host a tour with the participating artists, scientists and curators. All welcome. Featuring interactive and reflective works of art for all ages by artists Gordon Douglas, Trevor Gordon, Beverley Hood and Josie Vallely, and presented with objects from the collections of the University of Dundee. The exhibition draws on participatory workshops with Eczema Outreach Scotland and current research taking place in the laboratory led by Prof Sara Brown at the University of Dundee’s School of Medicine. The exhibition continues until 2 September. Please join us at the Preview of Future Emerging Art & Technology from 5-7pm in Life Space with a Semantic Laboratory live event by artists Špela Petrič & Miha Turšič occuring in the Dalhousie Building. Future Emerging Art & Technology includes six new works of art resulting from artists working in collaboration with scientists undertaking EU-funded Future and Emerging Technologies - FET open research to develop cutting edge technologies - from gene regulation to quantum physics, underwater robotics, exascale computing and more. Exhibition continues until 17 June 2017. Open Mon-Fri by appointment (email lifespace@dundee.ac.uk) or Saturdays 11am-5pm. boredomresearch, artist duo made up of Vicky Isley and Paul Smith, worked together with Dr Paddy Brock to create their generative work AfterGlow. This continuously changing animation presents a terrain progressively illuminated by glowing trails, evocative of mosquito flight paths. These spiralling forms represent packets of blood, carried by mosquitoes infected with Plasmodium knowlesi, a malaria parasite recently found to jump the species barrier from monkey to human. The infection left in the wake of wandering macaques as they search the island for food reveals the intimate relationship between disease and environment. Dr Paddy Brock collaborated with the artist duo boredomresearch on their generative work AfterGlow. He used statistical and mechanistic models to assess transmission-blocking interventions from malaria and the dynamics of co-infection between HIV and HPV (human papillomavirus). This research was used for the development of the animation that is on display in LifeSpace for the entire duration of the exhibition. During the seminar, Dr Paddy Brock will discuss this project, but moreover elaborate on his current research at the institute of Biodiversity, Animal Health and Comparative Medicine at the University of Glasgow. Ellie Land's work Sleepless elaborates on newly discovered links between sleep and mental health. The work is the result of a two year long conversation with Professor Peter Oliver, whose research focusses on gene function in the brain and its dysfunction in disease. Its rhythm is inspired by the circadian circle and displays visual icons rooted in the science of sleep, whilst featuring the voices of a group of mental health service users who share their experience of disrupted sleep/wake patterns. This talk will allow the artist to discuss the nature of the animation's research and the collaboration with scientists and mental health service users. 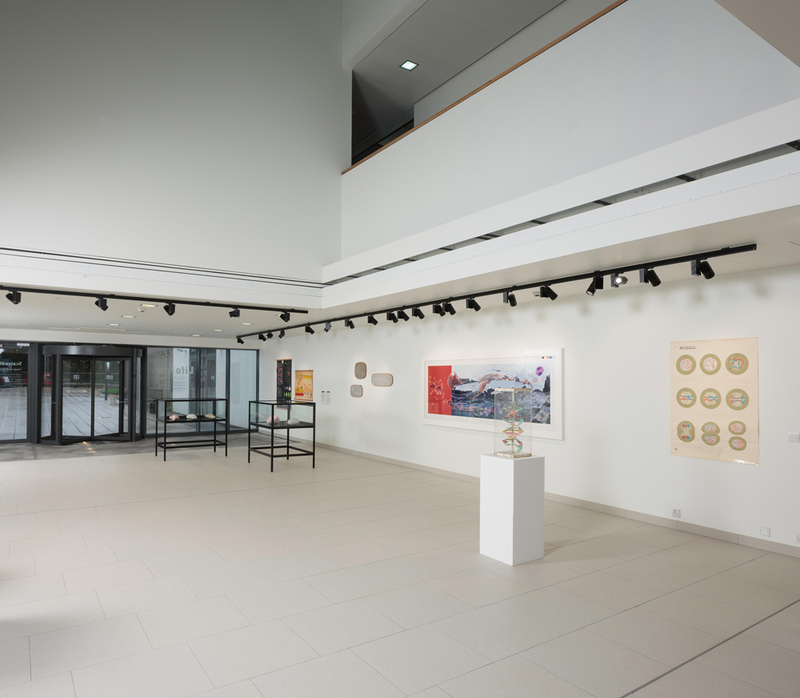 Land will talk about the work's relation to selected objects and artworks displayed in the gallery that she chose for exhibition from the University of Dundee Museum's collection. Genetic Moo, an artist collaboration between Nicola Schauerman and Tim Pickup, will come to LifeSpace to discuss their work Battle of Blister. This animation, the result of a collaboration with immunologist Dr Neil Dufton, presents the inflammation process using footage of human performers. Generated in an interactive film set, these animations chart the escalation from fly bite to full scale engagement. Battle of Blister shows the never-ending battle between bacteria and the body. As part of a collaboration with NEoN Digital Arts Festival taking place November 9-13 in venues across Dundee, Genetic Moo will talk about their work, their collaboration with scientists, and their use of digital media to create interactive installations. Artist and award-winning documentary maker Samantha Moore created the work Loop in collaboration with biomedical scientist Dr Serge Mostowy. This work illustrates what can be seen and what cannot, revealing the creative and discursive nature of science. Loop is based on drawings and discussions around cytoskeleton dynamics for which a zebrafish model is used. Lab members' description of the intricate sub-cellular septin dynamics and structure are incorporated into the animation. During this talk, Moore will elaborate on the collaboration with Mostowy and the work in his lab. She will discuss how the research directly fed into Loop and how the objects and artworks displayed next to it, on loan from University of Dundee Museum's collection, relate to the animation.